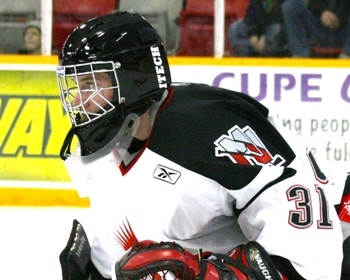 Goaltender Jeff Bosch has been stellar in the playoffs for the Moose Jaw Warriors. The Canadian Hockey League playoffs began in earnest this weekend, with many great storylines unfolding. By and large, the favourites are winning handedly, while the tight fourth and fifth seeds are dividing their series evenly. The one exception is the Calgary Hitmen - a team I predicted to win the whole Western Hockey League – who are losing their quarter-final series 2-0 to the Moose Jaw Warriors. Heading into the post-season Calgary had won 12 of their last 13 games, and collected a point in all of those matches. They were dominant defensively and offensively, rocketing up the standings with 107 points, the best record in the WHL. That strong final push gave them the privilege of playing the Eastern Conference’s eighth seed, lowly Moose Jaw. But the Warriors have had the Hitmen’s number thus far – dropping them 4-2 and 4-1 in their first four games. With the series moving to Moose Jaw for the next two games, things look grim for Calgary. It’s a surprising turn of events. The Hitmen are the only team in the WHL to lose to a lower seed in the playoffs thus far. The other seven series have stuck to the script. Goaltender Jeff Bosch is the key. He stopped 48 shots from tCalgary's attack in Game 1 of the series, and then turned away 29 in Game 2. If the Hitmen have any hope of turning things around they’ll need to find a way to get past Bosch. Hinse had his second overtime winner in as many nights as the Remparts eked out a 5-4 result over the Acadie-Bathurst Titan in the first round of the Quebec Major Junior Hockey League playoffs Friday night. Rob Flick's penalty shot got things going for the Mississauga St. Michael's Majors Friday night. It took an extra period but the Vancouver Giants rallied to a playoff win Friday night. Nicola Riopel and the Moncton Wildcats won a statement game in the Quebec Major Junior Hockey League playoffs Saturday night. Phil McRae and the Plymouth Whalers knew what they had to do to even their Western Conference quarter-final playoff series. The Moose Jaw Warriors continue to surprise in the Western Hockey League playoffs. Thomas Nesbitt provided all the offence the Ottawa 67's needed Sunday afternoon. 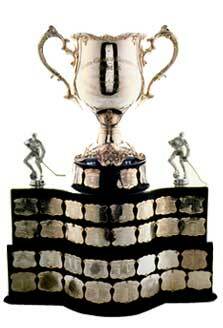 The race for the Memorial Cup is about to begin. There’s only one more week of the Canadian Hockey League’s regular season, and it’s do-or-die time for several teams. The Quebec Major Junior Hockey League has 14 of its 16 playoff berths decided, with the Val-d’Or Foreurs, Lewiston Maineiacs and Baie-Comeau Drakkar vying for the two final spots. With just 45 points and three games left in their season, the Drakkar seem like the obvious candidate to be on the outside looking in. They could still make it but they will need to reel off some wins. The Ontario Hockey League’s Western Conference is all settled, but in the East there are still three post-season spots available. The Belleville Bulls are already mathematically eliminated, with one of the Peterborough Petes, Niagara IceDogs, Sudbury Wolves and Oshawa Generals joining them within the next seven days. The Western Hockey League has the clearest picture of who is in and who is out. The Western Conference has been sorted out for weeks, while the East has only one seed still available. The Swift Current Broncos have the inside edge with 73 points, put the Prince Albert Raiders (67) and the Regina Pats (65) are within spitting distance. All three teams have played 69 games. By the time I check in for my shift on Friday, I expect there will be even more teams eliminated from playoff contention. It’s been a good, tight race all season, with hotly contested matches in every CHL league. The Moncton Wildcats delayed celebrations in Saint John for at least one more game. The Ottawa 67's got a big win off of their Ontario Hockey League Eastern Conference rivals Friday night. Jordan Weal and the Regina Pats bested their cellar-mates Friday night. The Drummondville Voltigeurs continue to have one of the stingiest defences in the Quebec Major Junior Hockey League. The London Knights are gaining some momentum as the Ontario Hockey League's regular season winds down. The Kelowna Rockets only needed Adam Brown and Tyson Barrie Saturday night. The Saint John Sea Dogs locked up home ice advantage for the Quebec Major Junior Hockey League playoffs on Sunday afternoon. Cam Fowler and Phillip Grubauer led the Windsor Spitfires as a familiar face returned to the line-up.